If you've been around the hobby for awhile, you're probably familiar with the red and white plaid Campbell Scale Models model train kits. These are usually classified as craftsman-type structures because they require some experience and familiarity with building scale models. 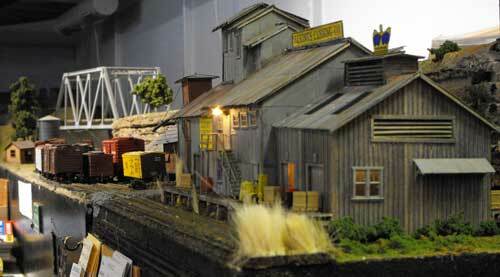 The Campbell model train kits are mainly wood and cardboard construction, sometimes with corrugated metal siding. Such was the case with King's Cannery. This kit had been sitting on my shelf for a number of years waiting for a place on the layout and the incentive to build it. The summer of 2009 turned out to be cool and rainy in Ontario, Canada and conducive to spending more time in the basement (between golf games, gardening and the other jobs on the never-ending "honey list"). This is one of those projects that is better not rushed. Doing a little here and there and leaving plenty of time for the glue to dry between steps. Follow along as I build King's Cannery and pick up a few tips and techniques. I am not a master modeler, just an ordinary guy who is as prone as anyone at making mistakes and I'll point these out as the structure takes shape. If you would like to receive a notification when I add pages to this website add my site to your RSS so you can receive updates as projects unfold. RSS just means you'll get updates and still remain totally anonymous to me. You'll find the RSS icon in the right-hand column on this page. Most model train kits of this level of difficulty always start off by telling you to read the instructions. If you're like me, you skim them to get a general idea of what's ahead of you, but you don't go through the steps one at a time. That was my first mistake. I did separate the wood and checked to make sure I wasn't missing anything important. The instructions in Campbell Scale Models model train kits are very thorough and I have built enough of them over the years that I'm comfortable following them from point to point. I don't often vary the sequence. However, in this case, I was well into the building sequence before I realized that the written instructions did not match the isometric drawing that shows all the parts. The two major inside partition walls (D and E) were mislabeled in the written instructions, although if I'd paid attention to the drawing I would have realized it before I glued the walls in place. I managed to bail out of the situation with the use of a single-edged razor blade without undue damage. Next time I'll take the warning to read and review the instructions of model train kits more seriously. By the way, I make it a habit to tick off each step as I do it with pencil so I always know where I am in the sequence. Glue blocks the stain. I like to use Hunterline Weathering Mix as a base. You could also use India ink and alcohol. Use a good quality glue. I prefer Carpenter's yellow glue. Others like plain old white glue. Use a toothpick to apply a thin coat of glue. Puddle a little glue on a sheet of waxed paper and dip the toothpick into it. Pre-paint all the plastic window and door frames with your color choice. When spray painting, tack all the plastic frames on a piece of double-sided tape. You can leave them on the sprues. I tape them to a cheap, thin plastic kitchen cutting board, the kind you can buy a a Dollar Store. For painting Campbell's corrugated aluminum, prime it first with Dullcote (this is in the instructions). This gives the metal some tooth for the paint to adhere to. I brush on Floquil Polly Scale SP Lettering Gray for an oxidized look. It usually takes two coats to get good coverage. (Use an alternative paint with a light grey colour now that Floquil is unavailable. I still have some bottle left. I'll use weathering powders later when the building is just about complete. Some prefer to weather the panels at the beginning. Why don't I weather now? Because I'll probably make some mistakes and have to do some patching of the metal. As it turned out, I had some major patching to do once I'd pulled apart the misplaced walls! 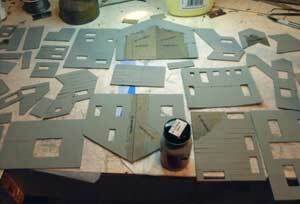 One of the tedious jobs is to cut out all the aluminum panels. I use a scale rule to get the 26" panels cut and use both several sharp X-Acto #11 blades and some single-edged razor blades. The instruction sheet gives the dimensions in inches (5/16"). 26 inches is the standard width for the panels to allow for a 2" overlap. The instructions suggest Walther's "Goo" to hold the aluminum to the cardstock. I use either "Goo" or Pliobond which has similar properties. This is the glue that we use when building Fast Tracks turnouts. I apply it with a small paint brush. Don't use white glue. It won't hold. I also tried Weldbond with mediocre results. It can be used in a pinch, but it tends to loosen if you need to trim the aluminum after it is glued in place.The first part of the project is to carefully cut out all the wall and roof parts from the cardstock. A good tip from Campbell Scale Models is to write the part number on the back of each piece. I now make this standard practice when building any kit. After all the parts are cut out and identified, I applied the aluminum panels and then painted the panels and all the windows and doors. 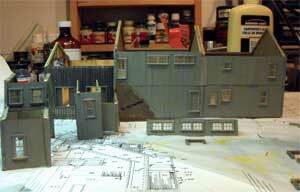 As this is a well-used factory of undeterminate age, I kept all paint gray and all wood as unpainted and weathered. The owners didn't waste money on making it pretty! This will also provide an excuse for some of the patching I will need to do. After doing this it was a matter of cutting the window panes from the supplied acetate and affixing the panes to the back of the frames. I use "Goo" sparingly for this part of the project. Acetone can be used to thin "Goo". Spread a little on an inverted measuring bar glass or something similar and use this as your glue palette. I tried some of my wife's nail polish remover on a cotton swab to clean up some messy spots. It worked reasonably well. Work in a well-ventilated are and use a good mask if you're using acetone. The kit comes with plenty of bracing material. I like to add even more to prevent warping. As you build the sub-assemblies, plan where you might like to add lighting or interior detail like a shadow box framing some people and machinery behind an open freight door. I'm going to add a shadow box behind one freight door. I have some black foam core board for the walls and a piece of scrap siding for the floor. I'm sure I can scrounge up some barrels and other stuff from my scrap box for the interior. I'll hang a grain of wheat lamp from the ceiling to light the interior.It's easier to add these details before you start closing up the model. King's Cannery takes shape. The shadow box interior will be behind the figure standing in the doorway. I use several machinist squares, a metal frame with magnets, and some model bar clamps to keep everything square. Take your time. Several of my sub-assemblies still didn't come out square and I needed to pull them apart and reglue them. Don't be afraid to fix these errors. It's wiser to do so now than try to fudge the roof to fit later. I had to add some more corrugated sheets to fix some of the mistakes. Thus far I have most of the main building sub-assemblies constructed and have completed the freight docks. The main building is glued together. I have a problem to rectify on the left hand center wall before completing the roof assemblies. I also have stopped so I can complete the shadow box behind the right hand freight door. Now that I 've found real estate on the layout, this side of the building and a siding will be facing the viewer standing in the aisle. Sometimes I struggle with wood model train kits. This was no exception. I haven't built a craftsman kit of this complexity for several years so I'm out of practice. At least, that's my excuse. The most difficult problem was getting the hoist towers squared up. The result was more dilapitated than I intended. I weathered the building to make it look well-used. It may have been better to fit these cardboard and metal sheathing additions to the main roof before applying the aluminum panels. I found it hard to trim the completed structures after the metal panels were affixed. I had to add more metal panels to cover up some errors and then repainted the entire building. I also departed from the instructions when building the staircases. I used Walthers Goo to assemble the staircases and to attach them to the walls. The written instructions and the plans didn't appear to match in several places. There was a section on the roof printed with "no corrugation", but I never did figure out what was supposed to go here. The photo on the box didn't show anything in these areas. Sometimes you need to depart from the instructions and use your own judgement. Nowhere does it say that you have to follow the instructions exactly. A trick I learned in Finescale kit many years ago was to mix some grimy black paint with some white glue and use it to represent tar around roof flashings. This is an easy way to disguise errors in roof seams. This kit has a lot of roof lines and the tar bailed me out of some awkward situations. After repainting the building I applied Hunterline's Weathering Mix to everything with a soft bristled 1/2" brush. I worked from the top down and applied extra grimy weathering where roof lines would have dripped. After this dried I applied Floquil rust color along some of the panel seams and speckled patches on the roofs where rust attacked the metal panels over the years. Then I dusted on several shades of powdered chalk using rust, black and burnt umber. Finally I dabbed on Polly Scale white using a dry brush technique to simulate bird poop on the roofs and window sills. By the time I'd finished the cannery looked like it had been around for a long time. I installed five 12 volt bulbs. One is in the shadow box. I added diagnonal braces of black foam-core board to stop light from showing through all windows. I installed bulbs over two of the doorways and another bulb inside the building. All leads were soldered to a 2-pin Miniatronics mini-connector. This allows me to pass one end of the plug through a hole in the homasote and plywood underneath the building. The other end of the connector is wired to a SPST switch on the fascia. This, in turn, is powered by a 12-volt transformer from Radioshack. I plan to use the same transformer to power other lights that will be added in the area around Port Feron. 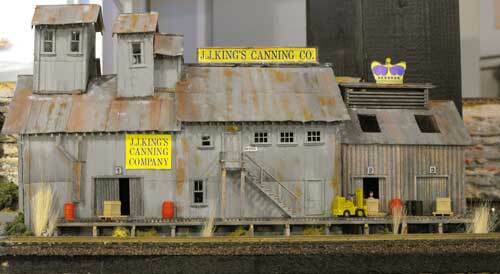 Finally, I "planted" King's Cannery trackside and added clump foliage, coarse turf and grasses around the building. I put in a road using Sculptamold topped with spackling compound that was sanded and painted with Lettering Gray and a wash of Hunterline's Weathering Mix. The spur was ballasted with Woodland Scenic cinders and a little bit of grass for weeds between the ties. I added wheel stops at the ends. This was a dual gauge area on the layout mixing HO and HON3. That's why you see three rails in some of the photos. On my new layout there on't be any narrow gauge track. I was tight for real estate for King's Cannery and the building would never really be seen from the back. I'm glad I completed it as three-dimenstional because the lights in the upper windows can be seen from the rear (actually the structure's front side). Also, on my new layout, the view will be different. The scene at this juncture was essentially completed. This area of the former UNRR layout was just to the left of the swinging entrance gate and there was a black-painted 2X4 support for the G-scale deck behind the right-end of the structure. A tree would have helped to disguise this a little bit. Below are some photos of the completed scene. This was a tough job that took about a month to build using a few hours here and there. It's not perfect but is certainly an improvement. Moreover, we now have another destination for the waybills. Trackside at night. The rear of King's Cannery faces the aisle. Right end at dusk showing lights. There's engine servicing to the left. Port Feron yard was to the left of the cannery. 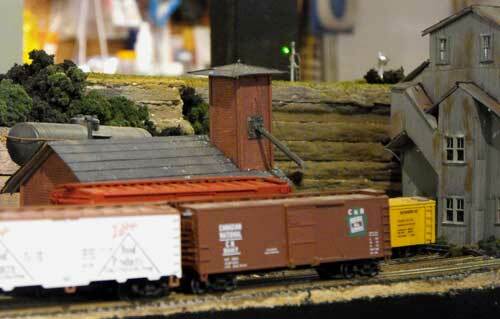 The boxcars in foreground are standard gauge. The yellow RGS boxcar is narrow gauge. The signals above the ceiling tile cliff were at High Bridge junction. 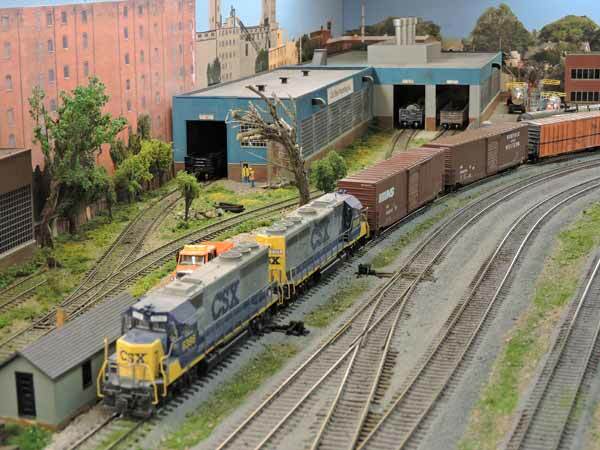 Go from "model-train-kits" to building CP Station #9 tips and techniques. 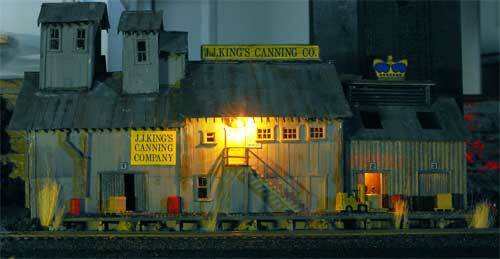 Return from "model-train-kits" to my Home Page.